Dormant Centurion can't attack unless you've played an action this turn. 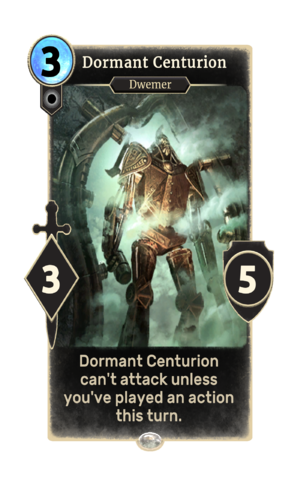 Dormant Centurion is a common Neutral creature card. It is part of the Clockwork City story set. A playset of the card is awarded for completing College of Winterhold. The premium version can only be obtained by soul-summoning, which is only possible after the completion of College of Winterhold. This page was last modified on 24 September 2018, at 22:38.